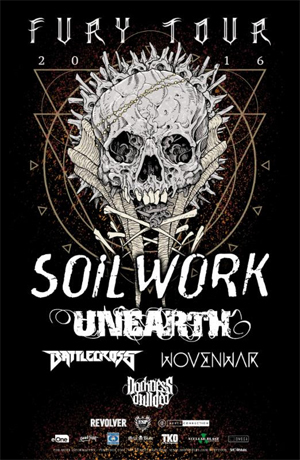 SOILWORK To Headline Second U.S. "Fury Tour"
Swedish melodic metal frontrunners SOILWORK are thrilled to headline the upcoming "Fury Tour", featuring support from a heavyweight line-up - UNEARTH, WOVENWAR, BATTLECROSS and DARKNESS DIVIDED. The "Fury Tour" will kick-off on October 14th in Providence, RI and hit 26 cities, coming to a close in Toronto, ON on November 16th. Tickets go on sale nationally starting August 12th and will be available via www.furytour.com, with VIP packages available now through Show Stubs via www.showstubs.com/furytour. SOILWORK vocalist Bjorn "Speed" Strid states, "We are very excited to announce our first North American headline run in a while, together with old friends in UNEARTH and WOVENWAR. We are also bringing BATTLECROSS and DARKNESS DIVIDED, two awesome bands that we are looking forward to get to know a bit better! We have already done two direct support tours in North America, for our latest album with SOULFLY and FEAR FACTORY, where we gained a lot of new fans. Now it's time to bring "The Ride Majestic World Tour" to North America via the "Fury Tour" in full force with a headline set, featuring songs from our 20 year long career. It's gonna be magical ladies n' gents, don't miss out!" UNEARTH vocalist Trevor Phipps states, "The power of the riff is hitting North America by way of the 'Fury Tour' this Fall and we couldn't be happier to be part of it. From the mighty SOILWORK to the thrashers in BATTLECROSS, our brothers in WOVENWAR and the young guns in DARKNESS DIVIDED this tour is stacked top to bottom. See you out there, North America."